Wallis subscribes to the English pre Raphaelites, like artists such as Dante Gabriel Rossetti and John Everett Millais. Although Wallis was already recognized, The stonebreaker cemented his reputation as a member of the movement. 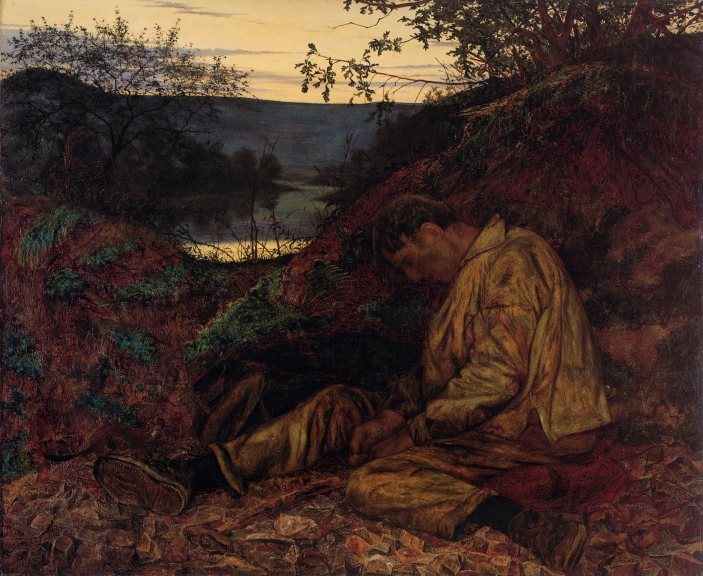 In this work we can see a quarry worker who seems to sleep in his workplace during a sunset. However, although never confirmed by Wallis, a closer look reveals that the character is not sleeping, but probably is dead. Since 1834, the British issued an act that worsened the condition of manual laborers. The exploitation they were subjected to caused that the employees to often die in their workplace as a result of exhaustion and fatigue. The frame of the canvas has a phrase written that says “Now is thy long day’s work done”. Although this can be naively interpreted literally, probably Wallis wanted to support these workers and the “long day” refers to their life, full of sacrifice and deprivation. The afternoon refers us to an end, a culmination. The uncomfortable position of the character seems to indicate that he is not lying, but has collapsed. The hammer seems to have fallen from his hands, which seems to confirm the theory of the worker’s death. The colors in this work are intense but muted, making this painting both tragic and depressing, but powerfully expressive. ~ by Álvaro Mazzino on December 19, 2011.
therapeutics market to be weak. The pilot makes annual payments, running over three years, reaching as much as $2,000, or about four times the maximum EITC credit currently available to childless workers. This entry was posted on December 19, 2011 at 14:52 and is filed under Uncategorized.You can follow any responses to this entry through the RSS 2.0 feed.You can leave a response, or trackback from your own site.